In this chart from Matt Murphy, a partner at Kleiner Perkins Caufield Byers, advertising mediums are parsed and scored by their “relative advertising efficacy”. Mr. Murphy’s chart shows “Mobile” scoring higher in aggregate than any other medium. While I am not sure I buy his analysis yet, I do agree Mobile advertising holds great promise. Coincidentally, my book For Sale By Google employs similar advertising efficacy metrics similar to Murphy’s. 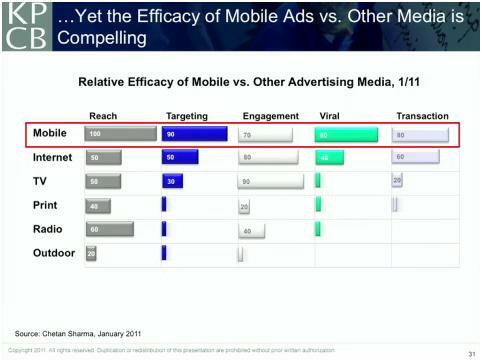 Murphy uses the terms “Reach”, “Targeting”, “Engagement”, “Viral” and “Transaction” to evaluate a medium’s advertising potential. The terms I use to describe to illustrate advertising efficacy will of course be found in my book. This entry was posted on February 23, 2011 at 5:55 pm and is filed under Relative Advertising Efficacy. You can follow any responses to this entry through the RSS 2.0 feed. You can leave a response, or trackback from your own site.